Veal is easy to cook, and it is even leaner and more tender than other cuts of beef. And veal offers as much protein as beef, but with a milder flavor. Veal cutlets, ground veal, and strips of veal meat are excellent choices for sauteing and stir-frying. Veal chops and steaks are best grilled or broiled. Use part ground veal with ground beef in meatloaf, meatballs, pasta sauces, or chili. Veal stewing beef is excellent stewed in liquid or braised, and veal breast, shoulder roasts, and blade steaks are good for braising in a small amount of liquid. To be sure the animals were raised humanely, look for "rose veal" or "pasture-raised" veal. Or look for the trademark, "Free Raised." Due to its delicate flavor, veal is compatible with many spices and seasonings. Some excellent choices include garlic, lemon, onions, mushrooms, shallots, white wine, rosemary, basil, capers, Madeira, pepper, and many more. For vegetables and side dishes, choose potatoes, rice, spaetzle, spinach, beets, creamed mushrooms, noodles, eggplant, carrots, and green beans. 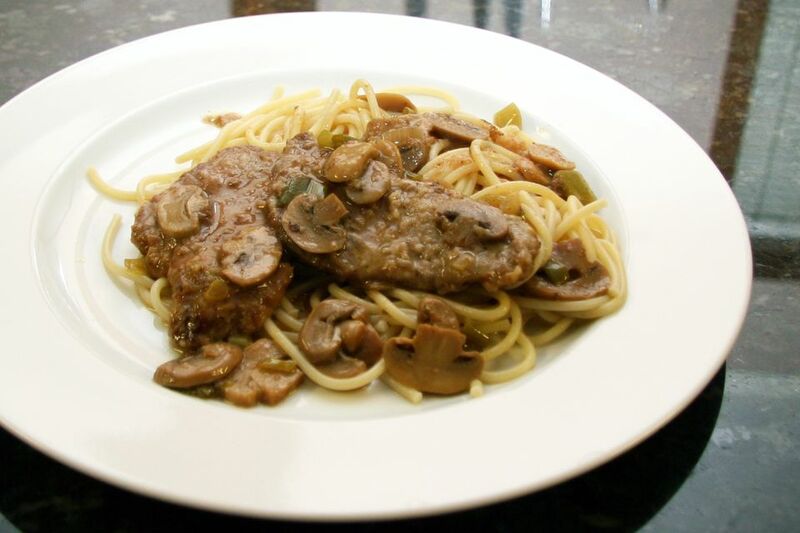 30-Minute Veal Marsala with Mushrooms: You'll find this classic dish on many restaurant menus. It's a fast and easy dish, and it is excellent with hot cooked spaghetti or angel hair pasta. Crock Pot Veal Stew With Potatoes and Sour Cream: This savory stew includes spices, potatoes, and mushrooms. Sour cream is stirred into the stew just before it's ready. Roast Veal with Mushrooms and White Wine: This stunning boneless veal roast gets its great flavor from several key ingredients: garlic, white wine, and rosemary. The roast makes an elegant meal for a special meal or Sunday dinner. Southwestern-Style Meat Loaf: Ground veal and lean ground beef team up in the meatloaf. Add some ground pork to the meat mixture if you'd like. Veal Rolls with Savory Bread Stuffing: Thin veal cutlets are stuffed with bread dressing mixture and baked to perfection. Serve them with the savory sour cream sauce. Veal Cutlets With Prosciutto and Sage: This is a classic Italian—Roman, to be exact—dish made with veal, fresh sage leaves, lemon, and wine. Veal Chops With Marsala Sauce: This is the upgraded veal Marsala 2.0, made with veal chops instead of cutlets. The recipe is special enough for a dinner party. Veal Cutlets With Lemon, Garlic, and Capers: The tasty lemon and caper sauce includes dry white wine and fresh lemon juice. The dish takes no more than 30 minutes to prep and cook, start to finish. Osso Buco: This is a classic Italian preparation made with veal shanks, vegetables, and herbs. The braised veal is surprisingly easy to fix and cook on the stovetop. Veal Loaf with Mushrooms: Ground veal and chopped mushrooms team up in this savory meatloaf. Feel free to make the loaf with a combination of ground beef and veal, or make it with about two-thirds ground veal and one-third ground pork for a juicier loaf. Traditional Dutch Vegetable Soup With Veal Meatballs: This delicious Dutch soup features ground veal meatballs. A variety of vegetables go into this soup, including broccoli, asparagus, carrots, leeks, cauliflower, and turnip. Veal Parmesan: This classic veal Parmesan is fabulous served with hot cooked noodles or spaghetti. The veal cutlets are breaded, fried, and then they're briefly baked with tomato sauce and cheese. One-Dish Veal Parmesan With Spaghetti: This light and easy veal Parmesan is finished in the oven atop hot cooked spaghetti. Veal and Peppers: Lean veal is stir-fried with fresh mushrooms, peppers, and tomato sauce. Veal Scallopini With Lemon: It doesn't get much easier than this! Add a salad or some fresh arugula, and you'll have an appetizing meal in less than 20 minutes. Louisiana Grillades and Grits: Use lean beef steaks or veal in this classic Louisiana brunch dish. Veal Patties or Burgers: Lemon juice and a dash of nutmeg add flavor to these veal burgers. The burgers are coated with fine breadcrumbs before they're fried. Serve in sandwiches if you'd like. Veal With Lemon and Mushrooms: This is an easy veal recipe with a tasty mixture of garlic, lemon juice, rosemary, and parsley. The veal and mushrooms make a spectacular presentation with freshly cooked broccoli. Veal Pot Roast Recipe for the Slow Cooker: This crock pot veal pot roast is an excellent way to cook veal shoulder. Veal Scaloppini with Mushrooms: The combination of tomatoes, mushrooms, and capers flavors these veal cutlets perfectly. Veal Steaks With Caramelized Onions: Caramelized onions and some fresh garlic add flavor to these delicious veal steaks. The extra special veal strip steaks are leaner than other cuts of beef. Easy Grilled Veal Chops: These veal chops are grilled to perfection with simple seasonings and fresh chopped thyme. Classic Veal Piccata: This 30-minute veal piccata is a simple yet impressive dish. Simple Veal Cutlets: These cutlets are cooked with a panko crumb coating.